This page will reveal all known polychoric dice up to twenty sides. All of the cells of each of these polychora are congruent. Most of these have never been displayed or even listed anywhere to my knowledge. The pictures were done with Stella4D and show a projection, the cell, and the net of each dice. 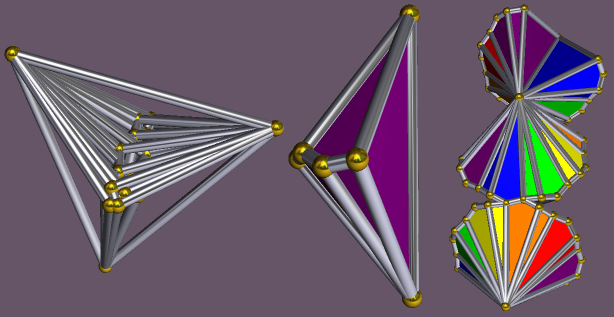 The pentachoron is a regular polychoron with 5 sides and is the 4-D version of the tetrahedron. It can also be created as a gyrochoron, it is the 5-2 gyro. It is an odd die, meaning that a vertex is opposite to a facet, so it lands corner up. It also has variants as does most dice. Variants of the pentachoron has a skew-pentagon symmetry. Triddip can also be called the "squared trigon" or "squared triangle" since it is the cross product of two triangles. It has 6 sides and is uniform. This die is a wedge die since a ridge (2-D face) will face up when it sits on a table. It is also the 6-2 gyro. The heptachoron or as I like to call it, Mobius 7, is the gyrochoron 7-2 and is also the 7-3 gyro. It has 7 sides. It is a skew die for when it sits on a 4-D table, it seems a bit skewed. The tesseract is the famous hypercube. It is a regular polychoron with 8 sides and is the 4-D version of the cube. It can also be created as a gyrochoron, it is the 8-3 gyro. It is an even die, meaning that a facet is opposite to a facet, so it lands cell up. It can also be called the squared square. It also has variants as does most dice. The tetrahedron gem, aka tet gem or tet tegum, is the dual of the tet prism (tepe). It has 8 sides. It can be a wedge die or a sloped wedge die, with an edge opposite the facet, usually at a slope. Mobius 8 is the gyrochoron 8-2. It has 8 sides. It is also a skew die. The trigon diamond, aka the triangular duotegum is the dual of the triangular duoprism (triddip). It has 9 sides. It is a wedge die, with an edge opposite the facet. Mobius 9 is the gyrochoron 9-2. It is also the 9-4 gyro. It has 9 sides and is a wedge die with a kite shaped face pointing up. The trigon tricoil is the gyrochoron 9-3. It sort of looks like a twisting crystal. It has 9 sides and is a sloped die with a vertex pointing up, but sloped to the side of a face. The decachoron, aka deca is a uniform polychoron from category 7. It has 10 sides shaped like tut. It can also be created as a gyrochoron, it is the 10-3 gyro. It is an even die. It also has skewed variants. The pentagon duoprism, or Pedip can also be called the "squared pentagon". It has 10 sides and is uniform. This die is a wedge die with a pentagon face pointing upwards. It is also the 10-4 gyro. A badly skewed variant is shown below. The gemmed decachoron is the dual of rap, aka durap. It has 10 sides shaped like trigon gems. It is a wedge die where an edge sticks up. Mobius 10 is the gyrochoron 10-2. It has 10 sides and is a skew die. Mobius 11 is the gyrochoron 11-2. It is also the 11-5 gyro. It has 11 sides and is a skew die. Rocky 11 is the gyrochoron 11-3. It is also the 11-4 gyro. It can also be called the hendecachoron. It has 11 sides and is a skew die. The hexagon duoprism, or Hiddip can also be called the "squared hexagon". It has 12 sides and is uniform. This die is even. It is also the 12-5 gyro. The cubic gem, aka cube gem or cube tegum, is the dual of the oct prism (ope). It is an even die with 12 sides. The trigon square duogem, aka triangular square duotegum is the dual of tisdip. It has 12 sides. It is a sloped die, with a sloped face opposite the facet. The dyad trigon duocrystal has 12 sides. It is a sloped die, with a sloped face opposite the facet. Mobius 12 is the gyrochoron 12-2. It has 12 sides and is a wedge die with a kite pointing up. The square tricoil is the gyrochoron 12-3. It has 12 sides and is an even, yet twisty looking die. The trigon tetracoil is the gyrochoron 12-4. It has 12 sides and is a sloped die with a vertex pointing up, but sloped to the side of an isosceles triangle face. Mobius 13 is the gyrochoron 13-2, as well as the 13-6 gyro. It has 13 sides and is a skew die. Rocky 13 is the gyrochoron 13-3. It is also the 13-4 gyro. It is a skew die with 13 sides. The tridecachoron is the gyrochoron 13-5, it has twice the symmetry as the other 13 sided gyros. This 13 sided die is odd with a vertex pointing straight up. When it comes to polytope dice, 13 is the magic number - there are 13 types of polytope dice with 13 sides: one in 2-D, three in 4-D, four in 6-D, three in 8-D, one in 10-D, and one (the simplex) in 12-D. No other number appears to do this. The heptagon duoprism, or Hedip can also be called the "squared heptagon". It has 14 sides and is uniform. This wedge die has a heptagon face pointing up. It is also the 14-6 gyro. Mobius 14 is the gyrochoron 14-2. It has 14 sides and is a skew die. Gyrus 14 is the gyrochoron 14-3. It is also the 14-5 gyro. It is an even die with 14 sides. Rocky 14 is the gyrochoron 14-4. It has 14 sides. It is a sloped die with a sloped isosceles triangle pointing up. The trigon pentagon duogem, aka triangular pentagonal duotegum is the dual of tipdip. It has 15 sides. It is a sloped die, with a sloped edge opposite the facet. Mobius 15 is the gyrochoron 15-2, as well as the 15-7 gyro. It has 15 sides and is a wedge die with a kite shaped face pointing up. The mobius dice are looking more and more like the smoothly curved bicoiloid. The pentagon tricoil is the gyrochoron 15-3. It has 15 sides and is a sloped die with a sloped hexagon ridge pointing up. The triswirl 15 is the gyrochoron 15-4, it has double the symmetry of other 15 gyros. It has 15 sides that can split into three swirling girdles of five, making it a polyhedral version of the more curvy tridyster. It is a wedge die with a rectangular looking hexagon ridge pointing up. The trigon pentacoil is the gyrochoron 15-5. It has 15 sides and is a sloped die with a vertex pointing up, but sloped to the side of a long kite shaped face. The pentagonal funk is the gyrochoron 15-6. It has a pentagonal equator and 15 warped looking pentagonal prisms for sides that form a trifoil knot. It is a wedge die with a kite shaped ridge pointing up. The hexadecachoron, hex for short is also called the 16-cell. It is a regular polychoron with 16 sides and is the 4-D version of the octahedron. It can also be considered as the square diamond and is even. The octagon duoprism, or Odip can also be called the "squared octagon". It has 16 sides and is uniform and even. It is also the 16-7 gyro as well as phase 3 of the 8-3 bigyro. The square crystal gem, aka square antiduotegum is the dual of the square antiduoprism. It has 16 sides and is a sloped die with a trigon ridge pointing up. The dyad square duocrystal has 16 sides. It is an even die. Mobius 16 is the gyrochoron 16-2. It has 16 sides and is a skew die. Gyrus 16 is the gyrochoron 16-3. It is also the 16-5 gyro. It is an even die with 16 sides. The trigon tetracoil is the gyrochoron 16-4. It has 16 sides and is a sloped die with a vertex pointing up, but sloped to the side of an isosceles triangle ridge. Funky 16 is the gyrochoron 16-6 and is a sort of hexagon "funk prism". Its 16 sides look like funky hexagon prisms with a couple pentagon faces. These "prisms" form a trifoil knot. It is a sloped die with a sloped pentagonal ridge pointing up. The domed 16 is an "ionic split tesseract". It is also phase 1 of the bigyro 8-3. It is an even die with 16 sides that have a domed house shape. The tetswirl 16 is a swirlprism like dice that has tetrahedral swirl symmetry with four girdles of four sides. It is also phase 2 of the bigyro 8-3. It is an even die with 16 sides. The cracked 16 is phase 4 of the bigyro 8-3. It looks like a hexadecachoron after an earthquake. It is an even die with 16 sides. The shattered 16 is phase 5 of the bigyro 8-3. It looks somewhat like cracked 16 and the broken tesseract. It is an even die with 16 sides. The broken tesseract is phase 6 of the bigyro 8-3. It looks like a warped and cracked up tesseract. It is an even die with 16 sides. The special 16 is a one hit intersection of the bigyro 8-3 where phases 1, 2, 3, and 4 meet. It is an even die with 16 sides. This is the intersection of phase 1 and phase 2 of the bigyro 8-3. It is an even die with 16 sides. This is the intersection of phase 2 and phase 3 of the bigyro 8-3. It is an even die with 16 sides. This is the intersection of phase 3 and phase 4 of the bigyro 8-3. It is an even die with 16 sides. This is the intersection of phase 1 and phase 4 of the bigyro 8-3. It is an even die with 16 sides. This is the intersection of phase 2 and phase 6 of the bigyro 8-3. It is an even die with 16 sides. This is the intersection of phase 5 and phase 6 of the bigyro 8-3. It is an even die with 16 sides. This is the intersection of phase 3 and phase 5 of the bigyro 8-3. It is an even die with 16 sides. Mobius 17 is the gyrochoron 17-2, as well as the 17-8 gyro. It has 17 sides and is a skew die. Gyrus 17 is the gyrochoron 17-3, as well as the 17-6 gyro. It has 17 sides and is a sloped die with a sloped decagon ridge pointing up. Rocky 17 is the gyrochoron 17-4, it has double symmetry. It has 17 sides and is an odd die with a vertex pointing up. Funky 17 is the gyrochoron 17-5, as well as the 17-7 gyro. It has 17 sides and is a skew die. The enneagon duoprism, or Edip can also be called the "squared enneagon". It has 18 sides and is uniform. This wedge die has an enneagon face pointing up. It is also the 18-8 gyro. The trigon hexagon duogem, aka triangular hexagonal duotegum is the dual of thiddip. It has 18 sides. It is a sloped die, with a sloped triangle opposite the facet. The trigon duocrystal has 18 sides. It is the dual of the trigon duoantiprism, which is not uniform. It is an even die. The trigon duoc, or "duocatri" is a powertope, it is the duoc of the triangle and it has 18 sides. It is a wedge die with an edge pointing up. The trigon antiduoc is related to the trigon duoc like an antiprism is related to a prism. It has 18 sides. It is a sloped die with a vertex pointed up and to the side. Mobius 18 is the gyrochoron 18-2. It has 18 sides and is a wedge die with a kite shape ridge pointing up. The hexagon tricoil is the gyrochoron 18-3. It has 18 sides and is an even die. Rocky 18 is the gyrochoron 18-4. It has 18 sides and is a slope die with a sloped hexagonal ridge pointing up. The triswirl 18 is the gyrochoron 18-5, it is also the 18-7 gyro. It has 18 sides that can split into three swirling girdles of six, making it a polyhedral version of the more curvy tridyster. It is an even die. The trigon hexacoil is the gyrochoron 18-6. It has 18 sides and is a sloped die with a vertex pointing up, but sloped to the side of a long triangle shaped ridge. The hexagonal funk is the gyrochoron 18-3/2. It has a hexagonal equator and 18 warped looking hexagonal prisms for sides that form a trifoil knot. It is a sloped die with a sloped triangle ridge pointing up. Mobius 19 is the gyrochoron 19-2, as well as the 19-9 gyro. It has 19 sides and is a skew die. Gyrus 19 is the gyrochoron 19-3, as well as the 19-6 gyro. It has 19 sides and is a sloped die with a sloped dodecagon ridge pointing up. Rocky 19 is the gyrochoron 19-4, as well as the 19-5 gyro. It has 19 sides and is a sloped die with a sloped hexagon ridge pointing up. Funky 19 is the gyrochoron 19-7, as well as the 19-8 gyro, it can also be called the heptagonal funk prism. Its 19 sides look like warped heptagonal prisms that form a trifoil knot path. It is a sloped die with a sloped kite ridge facing up. The decagon duoprism, or Dedip can also be called the "squared decagon". It has 20 sides and is uniform. This die is even. It is also the 20-9 gyro and phase 3 of both the bigyro and the antibigyro 10-3. The square pentagon duogem, aka square pentagonal duotegum is the dual of squipdip. It has 20 sides. It is a sloped die, with a sloped triangle opposite the facet. The dyad pentagon duocrystal has 20 sides. It is a sloped die, with a sloped triangle pointing up. The pentagon crystal gem, aka pentagon antiduotegum is the dual of the pentagon antiduoprism. It has 20 sides and is even. The crystalic 20 is the dual of spid, aka "duspid". It has 20 sides that look like flattened cubes. It is even. It is also the intersection of phase 1 and 2 of the antibigyro 10-3. This shape is also the shadow of the penteract. The mounted pentachoron is the dual of tip, aka "dutip". It has 20 sides and it's a sloped die which is sloped with a slanted edge pointing up. The prismigemmed 20, aka tudurap is formed by the core of two intersected gemmed 10s (duraps). It has 20 sides and is even. It is also the intersection between phase 1 and 2 of the 10-3 bigyro. Mobius 20 is the gyrochoron 20-2. It has 20 sides and is a skew die. Gyrus 20 is the gyrochoron 20-3, as well as the 20-7 gyro. It has 20 sides and is even. The pentagon tetracoil is the gyrochoron 20-4. It has 20 sides and is a wedge die with a kite shaped ridge pointing up. The square pentacoil is the gyrochoron 20-5. It has 20 sides and is an even die. The funky 20 is the gyrochoron 20-6. It has 20 sides and is a wedge die with a kite shaped ridge pointing up. The double helix 20 is the gyrochoron 20-8. It has 20 sides that form two closed helixes that wrap around each other. It is a wedge die with a pentagon shaped ridge pointing up. The rocky 20 is the gyrochoron 2*10-3, it is also the gyrochoron 2*10-2, and phase 1 of the antibigyro 10-3. It has 20 sides and is an even die. The chunky 20 is phase 1 of the bigyro 10-3. It has 20 sides and is an even die. The clunky 20 is phase 2 of the bigyro 10-3. It has 20 sides and is an even die. The stegosaur 20 is the transition between phase 2 and 3 of the bigyro 10-3. It has 20 sides and is an even die. The broken crystalic 20 is phase 2 of the antibigyro 10-3. It has 20 sides and is an even die. The special 20 is the transition between phase 2 and 3 of the antibigyro 10-3. It has 20 sides and is an even die.